In many ways, I like to think that the UK is superior to the US: superior chocolate, superior music and superior public toilets (why do all toilets in America have huge gaps either side of the door?) There are, however, two occasions when my opinion is proven wrong: when the US celebrates autumn (or ‘fall’) and the enthusiasm with which it does Halloween. I hadn’t considered that my trip to Washington DC would coincide with both occasions. Instead, I’d planned to spend most of my visit playing ‘peekaboo’ or hanging out at the local park with my niece. 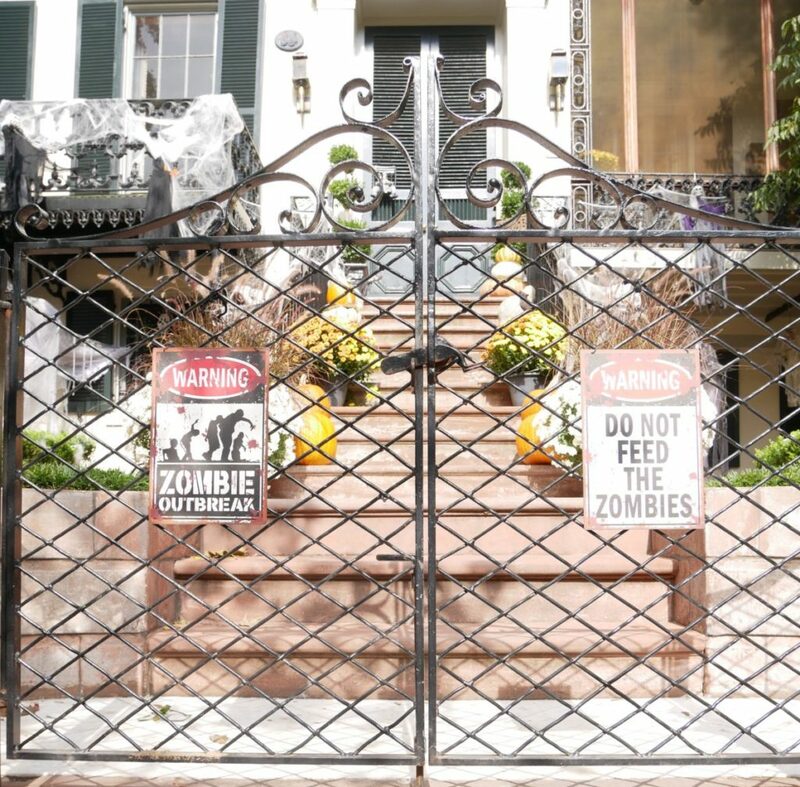 My plans changed, however, the moment I stepped out of the taxi into the beautiful neighbourhood of Georgetown, where I was greeted by Halloween and fall on levels unimaginable to us Brits. Adorning every step sat pumpkins of all shapes and sizes. Orange ones, green ones, yellow ones, ones with bumps and lumps all over them – they had them all and I was fascinated. In the UK, in my limited experience of pumpkin buying, I’ve only ever seen the bog-standard orange variety (I’m sure they have a particular name). The variety on offer in the US, however, was something else. They even came in mini form, which I found particularly delightful. Before I had even made it to the front door of my brother’s house, I was already half-way down the street, clapping my hands like a seal. What made these magical little scenes even more enchanting were the crisp autumn leaves that were falling across the streets, lining the wonky red-brick pavements with rich orange, red and yellow bursts of colour. In the UK, we have similar colours, but it must be something about the cold, Atlantic air that turns the leaves in the US extra crispy and bright. In rainy, old England, the leaves are usually damp, brown and mushed within 12 hours of falling, and so lack the beautiful ‘fall’ colours that decorate the US. 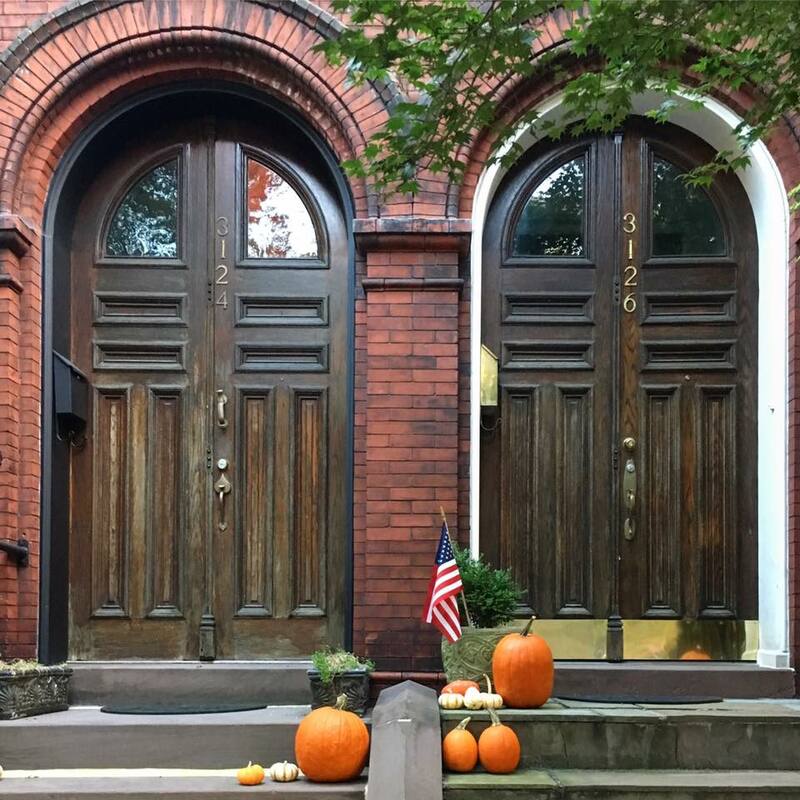 The warm afternoon sunshine, falling leaves and pumpkin scatterings gave me a boost of energy after an eight-hour flight of intense film watching, and so we set off to Georgetown’s oldest drinking establishment, Martin’s Tavern, for a pumpkin spiced beer. I don’t remember much after that beer. After a long day of travel and the excitement of being reunited with my niece, I was asleep by the wild hour of 8.30pm. The next day, refreshed, we took the opportunity to revisit some of our favourite DC landmarks, whilst enjoying the unseasonable balmy temperature of 28 degrees. Starting at the Lincoln Memorial, which was just as impressive as I remember, we made our way down the Mall, slurping on red, white and blue popsicles (I just love that word) whilst enjoying the changing shades of the trees. Slightly sunburnt and in need of a cool down after joining the crowds outside The White House, we treated ourselves to lunch at one of DC’s landmark eateries: Old Ebbitt Grill. In the cool, shady interior of the restaurant, which opened in 1856, we slipped into a booth to enjoy juicy cheeseburgers and fries. I was living the American dream. The afternoon was spent in the park with my niece, dutifully fulfilling the auntie role of breaking all the rules and pushing her far too high on the swing, before letting her run around in the leaves with no shoes on. 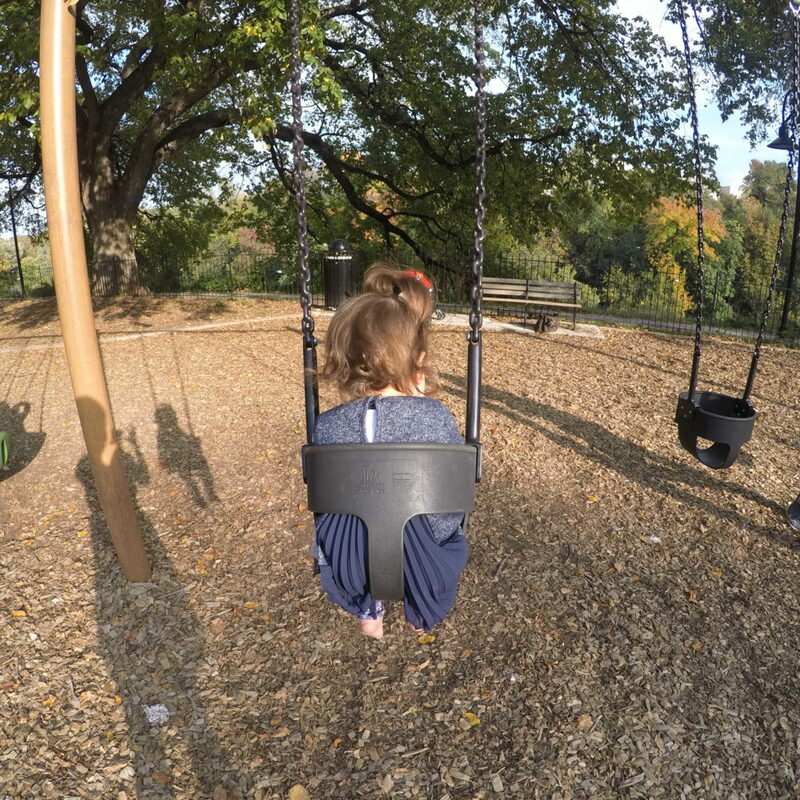 I took the opportunity to play around a little more with the GoPro Hero5, capturing some shots of her on the swings using the burst capture. 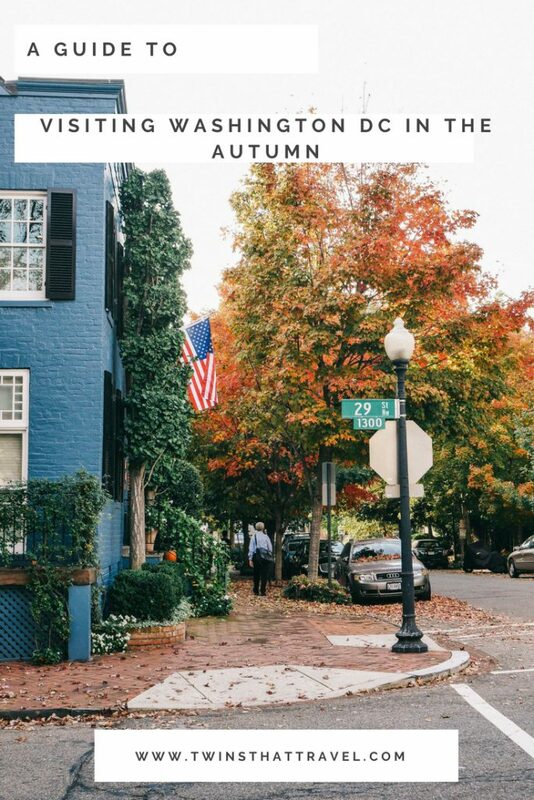 It was the perfect autumnal afternoon before celebrating Friday’s arrival with dinner in Georgetown. On our last trip to DC, we ran out of time to visit the Capitol and so our second day in DC took us on the seemingly never-ending Circulator bus up to the Capitol neighbourhood. We passed the time on our mammoth hour-long bus journey by humming the theme tune to West Wing. Such cool customers. 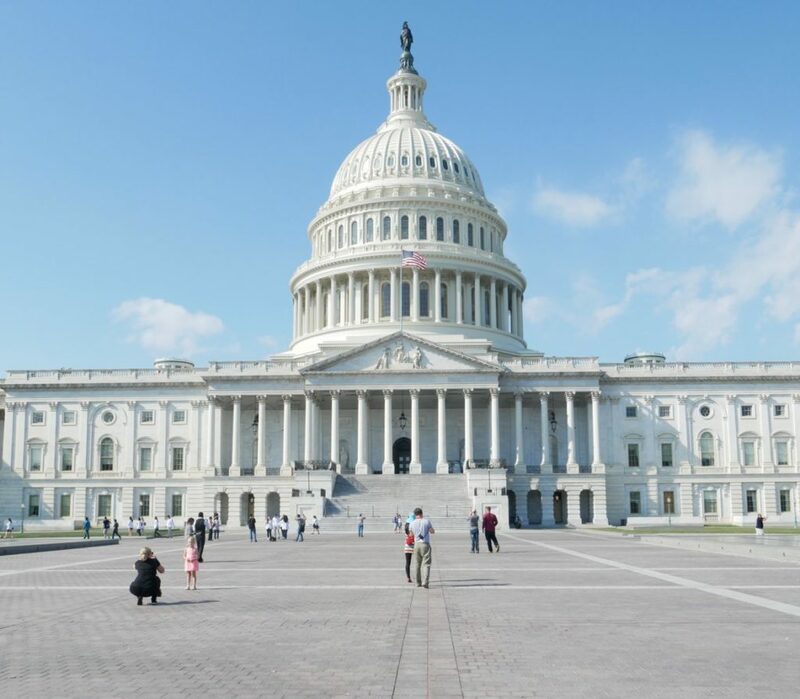 I had heard a lot about the beautiful Library of Congress and so we headed straight there after gawping at the Capitol, which seemed to be positively glowing in the mid-day sun. I do love a library, having been spoiled when studying at Oxford, and I was blown away by the beauty of its interior: particularly the ceiling and the reading room (a symmetrical heaven for any keen Instagrammers out there). 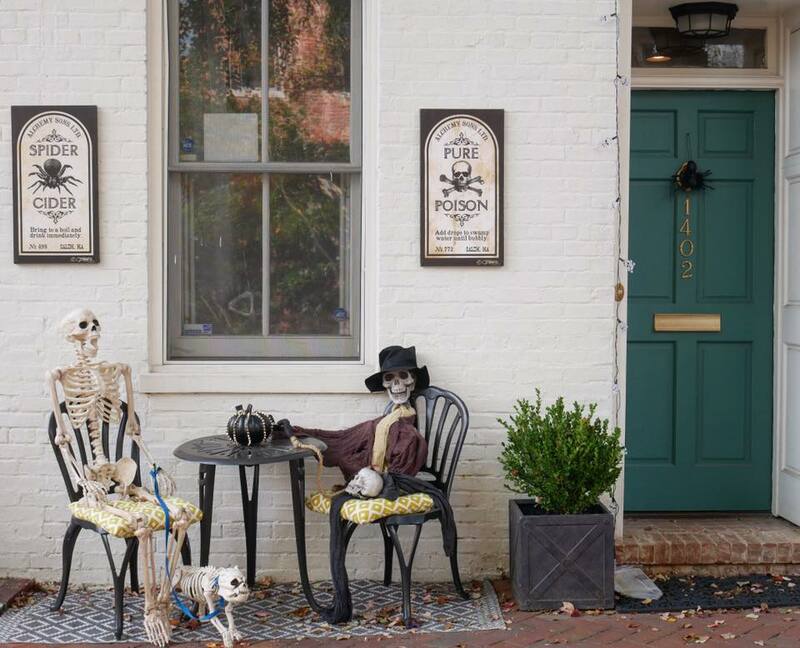 After an afternoon stroll around the Capitol neighbourhood, enjoying its quirky cafes and spying more Halloween-themed houses, the weather dramatically changed and a storm rolled in. Running for our lives (well, it felt like it for me), we scampered into Union Station looking like drowned rats, as thunder crashed down on top of the echoing atrium. I love this station – watching people hurriedly pass through it on their way to shiny, exciting cities like NYC. Unfortunately, there wasn’t time to stop this time, as I had an important date back in Georgetown. At a cat cafe. You see, aside from my love of travel, I harbour another obsession: an obsession for cats. I love cats. I have my own cat, Bea, and always miss her like a child when I’m away. What better way, therefore, to silence my cat-sick pangs than a trip to Georgetown’s cat cafe: Crumbs and Whiskers! Stepping into the cafe, aka. heaven, we were met by twenty cats, dotted between two floors. Some were sleeping; small fluffy balls in hidden corners, whilst others careered around, chasing toys dangled by other guests. 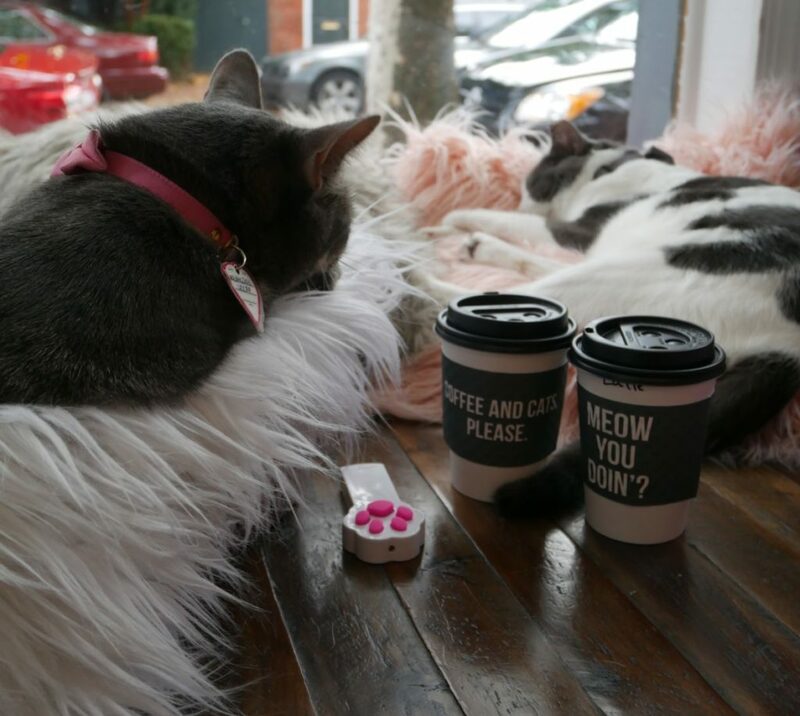 Aside from the cat merchandise and custom drink holders (‘Meow you doin?’) my favourite part of my experience at the cafe was learning that all the cats are formally up for adoption. Since the cafe has been open, they have seen over 150 cats re-homed, who would have otherwise been euthanised at animal shelters. This was hugely reassuring to hear, and it was good to know that my monetary contribution (I also bought a cat shaped ring), is ultimately going towards helping cats to find new homes. I left a very happy customer. Before long, the weekend had rolled around and it was time to spend some quality family time at some of DC’s attractions. We opted for the National Museum of Natural History, somewhere I’ve visited previously and adored. I couldn’t wait to take my little niece, giving me a genuine excuse to run around like a child. My favourite ‘toy’ on this visit was the computer that took your photo and reverted the image back to how you would have looked in caveman times (technical terminology there). You’ll have to message me for the photo (ah ha, you don’t have my number), as it will never see the light of day on this blog. As the evening drew in, it was time for the event that I had been waiting for: a special Halloween event at DC’s Zoo. Not to be exposed as British party-poopers, we carefully dressed my niece as a witch and set off to see what the night would hold. As it turns out, it held mainly parents seemingly forcing their children to the zoo, so they could dress up in some of the strangest outfits I’ve ever seen. In the UK, Halloween fancy dress doesn’t extend much past a witches’ hat or a pair of devil horns. In the US, however, it seems that anything goes. My favourite spot was two parents dressed as complimentary condiments: ketchup and mustard. It was quite the night. A lazy Sunday meant that we took the opportunity to explore more of one of our favourite neighbourhoods in DC – DuPont Circle and to also explore somewhere new – the city of Alexandria. Both must-see areas in and around DC for any visitor. 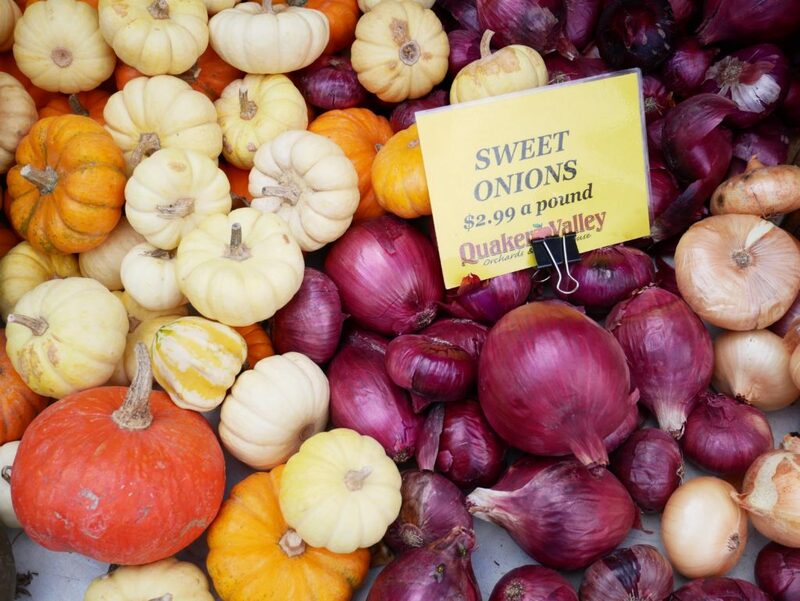 Strolling around in yet another unseasonably warm autumn’s morning, we stumbled across the Sunday food market in DuPont and were quickly devoured up by the crowd, who mulled along, sampling crunchy slices of apple and juicy pears. Stuffing our bellies full of delicious local produce, we waddled back to Georgetown, ready to cram into a car and head to Old Alexandria for a lazy Sunday lunch by the water. Watching the ferries chug in and out of the little port, I enjoyed crab tacos and ice-cream. Old Alexandria is a beautiful spot to visit when in DC, and when I haven’t got a niece who is in urgent need of a nap, I intend to explore it more on my next visit. Our final day in DC was assigned to wandering Georgetown’s high-end shops and buying a few presents, before treating myself to the famous Georgetown Cupcakes (a blog post to come on eating in DC). I couldn’t help but steal one last walk around the beautiful neighbourhood, taking some final photographs of the Halloween decorations and stomping my feet through the fallen leaves. It was with a heavy heart that I had to leave DC: a city that has quickly become one of my favourites in the world. Visiting during autumn and getting to experience Halloween at its best, was just an extra treat on top of an already special trip to see my niece. I’ll be back next year. 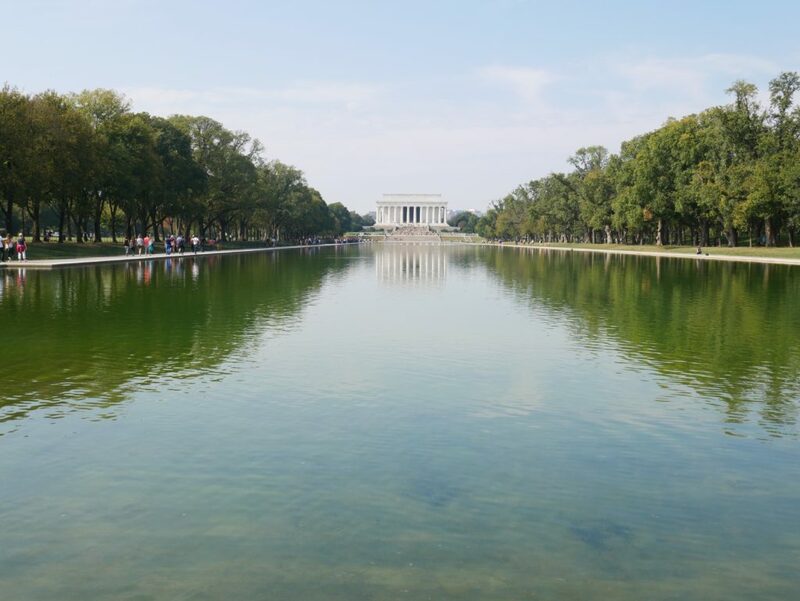 Have we inspired you to visit DC? Let us know in the comments below! "The Cosmopolitan Influencer Awards 2016"
I also believe that our bog standard pumpkins are simply known as ‘Halloween pumpkins’ ! !